Since I’m going to a staged reading of three episodes from the TV show M*A*S*H tonight, I thought I’d post a snippet from my story For the Boys today. This story is unabashedly inspired by that show, which has always been one of my favorites. I hope I managed to capture the atmosphere of the war convincingly in this short piece, which was a lot of fun to write. He stood so close I could feel his breath warm the back of my neck. The heat coursed through my body to curl in my groin and my hands trembled slightly on the lantern, causing the shadows to dance around us. With a smile, I looked over my shoulder and into his eyes, a dark blue by the light of the lantern. “Anytime.” My deep voice sounded deeper than usual. He leaned forward and pressed his mouth against my shoulder, his eyes watching me carefully. Through my fatigues I swore I could feel his lips, his breath. When I didn’t move away, he took a step closer and his arms came up around my waist, tentative, his eyes never leaving mine. I could tell he was testing me, making sure he was right about me, making sure I was like this and wanted him to touch me, and the first move I made would chase him away, so I held my breath and kept still. “It’s okay,” I whispered, my voice barely audible in the quiet tent. Outside a shell exploded, miles away, a distant boom like thunder, and I took his hands in mine, interlaced our fingers together. Fear closed my throat. Like this … what are you talking about? Every instinct told me to pull away before he said or did something that would jeopardize my position in the Army, but I hadn’t been held in a long time and his body felt so right against mine. “Like what?” I asked, trying to find the will to let go of his hands. My fingers only held onto his tighter. “I don’t pick up boys at every camp,” he said. I looked over my shoulder again and right into his eyes, twin pools reflecting the lantern and my own image back at me. When I smiled, his hands dared to slip lower, and he cupped the buckle of my belt, his fingers brushing along the zipper of my pants. Giving me a light squeeze, he let go and stepped back. Hold me again, I wanted to tell him. Don’t let go this time. But I didn’t. “I need to get changed,” he told me as he began to unzip my field jacket. I liked my name, PROSSER, on his chest, my insignia, my patches on his body. I liked him in my jacket, and when he unzipped it, I liked the way the light winked off his costume beneath the dark Army green. I wanted to see him in my drab olive undershirts, or wrapped up in my long-sleeved camouflage shirts, or beneath the covers of my cot. When was the last time I had felt like this? 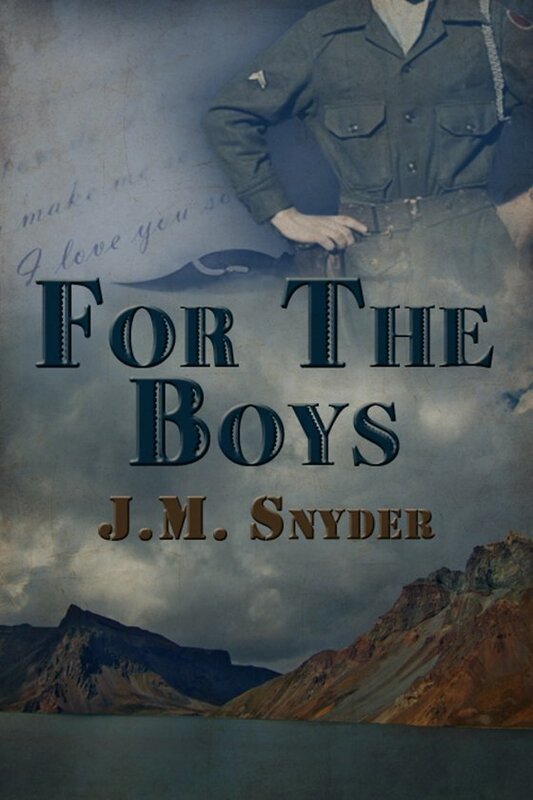 I couldn’t remember — even before the war had started, there were just a few boys back home, one or two I had been interested in, but we drifted apart when I left for basic training and I never managed to get back in touch with them again. Read another excerpt or buy the ebook today!